Many raw food advocates sing the praises of juicing vegetables as a way of taking in a variety of nutrients and improving your health. Many people do not think of juice when it comes to celery, but celery juice offers vitamins and minerals as well as a different taste compared to other, more commonly available vegetable juices, including tomato and carrot juice. A 1/2-cup serving of celery juice contains 40 calories. This number of calories is on par with the same volume of carrot juice. The U.S. Department of Agriculture’s Food Pyramid calls for you to consume three to five servings of vegetables each day, and drinking a serving of celery juice helps you meet that nutritional goal. Note, however, that one serving of vegetables equals a 3/4-cup portion of celery juice or other vegetable juices. Celery in its solid form contains little in the way of macronutrients, and the same is true of celery in juice form. One serving of celery juice contains no fat as well as 1 g of protein. Your eating plan should include 46 to 56 g of protein per day, so consider consuming celery juice with a meal containing a lean protein, such as chicken breast or tilapia, to bolster your protein intake. A serving of celery juice also provides 5 g of carbohydrates, just 3.8 percent of the 130 g of carbs your diet should include. The majority of the calories in a serving of celery juice comes from carbohydrates. Drink a serving of celery juice, and you will take in 16 percent of the vitamin C you need each day. The vitamin C in celery juice plays a critical role in bolstering your immune function as well as improving your body’s ability to heal wounds. You’ll get smaller amounts of iron and calcium – 6 percent and 1 percent of the daily recommended intake, respectively. This makes celery juice a good choice for contributing to the oxygenation of your body and bone health. 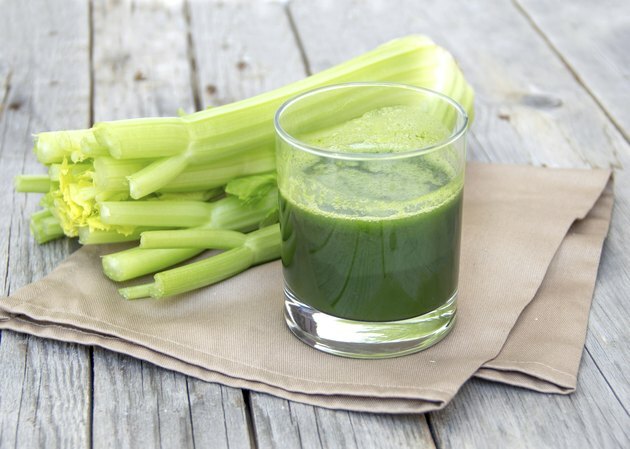 Celery juice may protect your body from cancer. This vegetable is high in cancer-fighting compounds, including phthalides, polyacetylenes and coumarins. The Park Ridge Cardiology website notes that these nutrients may prevent tumor cells from growing, detoxify cancer-causing particles in your body and lower your risk of cellular mutations. The physicians at this practice recommend drinking 10 oz. of celery juice twice per day for its anti-cancer benefits. What Are the Benefits of Lemon & Cucumber Juice?